This week Mikey and Lewis are joined by special guest local MMA star and undefeated double champ Glenn Williams. We kick things off talking about Glenn's MMA bout on the weekend before jumping in to the movie news and getting The Sledge's views on both the news and our Was it that Bad review which this week Is Escape Plan 2: Hades. As usual we go on to the MCU corner and Homework time which Glenn decided was 3 Ninjas...an absolute gem from our youth but does it hold up. 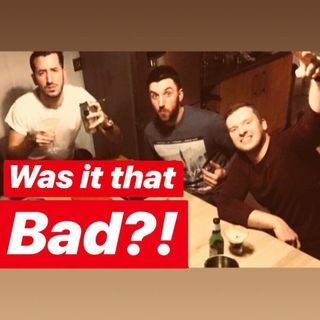 as normal ... See More the quiz follows but with our resident barman out of action this week we go straight in to what we have watched this week. A shout out to our fellow podcast brothers at "Chump Change" and "Common clay of the new west" for brightening our day with their content! A big thank you to Glenn joining us this week and we hope you all enjoy!